This year marks the 75th anniversary of The Idle Women – the nickname for the women who manned the working boats during WWII. 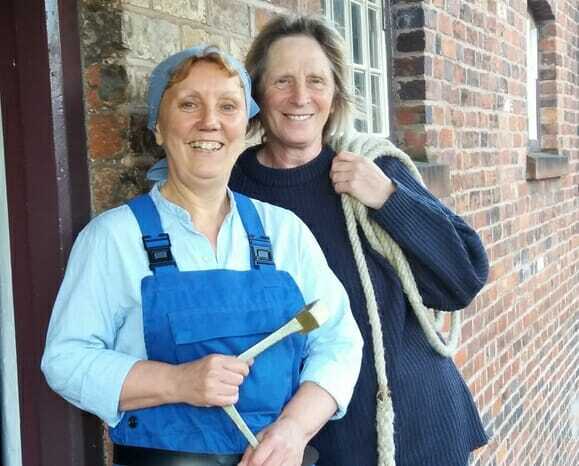 Now, 21st century ‘Idle Women’ – former Worcestershire Poet Laureate Heather Wastie and writer/performer Kate Saffin – will be recreating their journey, from London to Birmingham and back to London via the Coventry coal fields. We spoke to Heather Wastie to find out more about this very unique tour. You’re taking your show, ‘Idle Women and Judies’, out on tour, alongside Kate Saffin in a double bill, firstly what’s your show about? ‘Idle Women and Judies’ was commissioned by the Canal & River Trust in 2014 and is a performance poem based on the memories of Emma Smith, Nancy Ridgway and Daphne March (Daffy). Emma is the author of Maidens’ Trip, A Wartime Adventure on the Grand Union Canal and Nancy worked on the Leeds and Liverpool Canal where the women were referred to as ‘Judies’; their voices can both be heard when I recreate snippets from Canal River Trust archive interviews. The two voices contrast in such a way as to demonstrate the range of women who took over the working boats while the men went off to war. Extracts from Emma’s book are also woven into the piece, as are some of Daphne’s words taken from an article she wrote after the war (shared online by her niece, Kathryn Dodington). This poem, along with the others in my show, are ‘found’ pieces, so called because they are made up primarily of words I have found, either spoken or in writing. The poems use words by Eily (Kit) Gayford, Susan Woolfitt and Margaret Cornish, and maybe others – I’m still writing. There are also some songs including one celebrating the women and explaining how they came to be called ‘Idle’. How does it differ to Kate Saffin’s ‘Isobel’s War’? Kate’s is one piece – a play about a fictional woman telling true stories; mine is a collection of poems and songs, performed from the point of view of different women in each piece. Poetry is a much more concise way of telling a story. I have chosen words which follow a rhythm but at the same time try to make them sound as natural as possible, using the original spoken or written words where possible to maintain authenticity. The songs are catchy ‘ear worms’ which rattle around in your head after the show. I finish with a song which has a chorus everyone can sing. How did you first come across the ‘Idle Women’? When the Canal River Trust commissioned me, they sent a selection of archive recordings. As soon as I heard Emma Smith I knew this was a subject I wanted to find out more about. This is a pretty unique tour, what gave you the idea of doing it ‘canal-side’? It seems an obvious thing to do, especially as Kate lives on a boat and the first tour we did (summer 2016) followed the latter part of Kate’s journey from London (where she is based) to Kidderminster (where I live) and beyond. She ended up in Edinburgh – not on the boat! Of course, Mikron Theatre have been touring canalside theatre shows since I was a child, so we had an excellent model to follow. Some venues had hosted Mikron shows in the past, but we have also introduced many new venues to travelling theatre. How will you keep yourself motivated when you are out on tour? By remembering that every time I perform, the audience are probably hearing my work for the first time. Every time I perform a poem, I try to do so as if it is the first time I have spoken those words. Every performance is different, influenced by the venue and audience and the fact that I am getting to know the pieces better. I enjoy having fun with the songs, especially when people join in. Because my show is made up of separate pieces, there’s scope for some informal banter in between, whereas Kate has to stay in character throughout her play. After the show, I enjoy hearing memories we have stirred up in members of the audience too. The two shows contain a great deal of information about how the women lived and worked and the impact the war had on their lives. Audiences learn by being drawn into the action as we bring the stories to life. The show draws attention to this crucial war work and refers to many of the women by name. Those in the audience who already know a lot about the women enjoy experiencing the stories in a new way and usually find something new in our show, and others say how eager they are to seek out the women’s books and read them for themselves! Find out where to see the tour here.